French import Jack and the Cuckoo-Clock Heart originated as a combination of a book and a concept-driven album, La Mecanique du Coeur, from the band Dionysos, influenced by the brand of macabre, lyrical storytelling you'd typically find in Tim Burton's oeuvre. 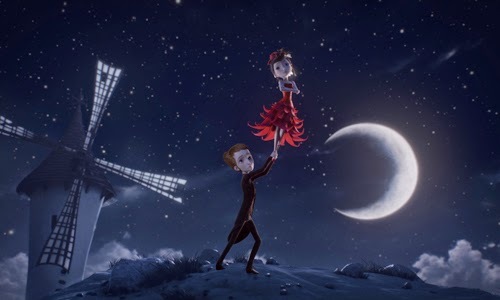 The narrative mixture successfully blended into an animated music video for one of the album's catchier tunes, "Tais-toi mon coeur", which naturally sparked the idea to transform its fantasy-bound concept -- a boy with a cuckoo-clock heart is forbidden to fall in love for health reasons, yet does so anyway -- into a feature-length motion picture. Director Stephane Berla, who also directed the music video, shares creative duty with the band's lead singer, Mathias Malzieu, to shape the seemingly easy-to-adapt book, music, and visual concepts into a form of the story befitting the big screen. Unfortunately, despite its infectiously quirky concept and an alluring visual style, the repeated winding of Jack's heart seems to have worn down the fluid movement of its mechanisms, resulting in a rickety display of breakable hearts and day-seizing. We're transported to a fanciful version of mid-1800s Edinburgh, Scotland in the story's beginning, starting on the coldest evening in recorded history. Through the frost and persistent snow, a pregnant woman makes her way to a local witch midwife, Madeleine, who offers her booze and pancakes before beginning the birthing procedure. After the mother's delivery, the midwife discovers that the baby's heart has been frozen solid (somehow, the other internal organs are fine), leading her to improvise a functioning heart for little newborn Jack: a small cuckoo-clock heart, complete with a sharp-beaked bird that juts out. Under the midwife's care following his mother's abandonment, Jack lives an isolated life where he abides by a series of rules to keep him safe considering his condition, until he's old enough to travel with Madeleine to the city. There, he runs the risk of breaking one of his rules -- to never fall in love -- when he meets Miss Acacia, a musically-inclined young girl whom he immediately falls for. 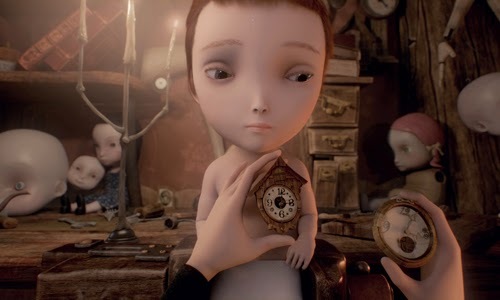 If creative aesthetics were the only components needed for a quality piece of animated storytelling, then Jack and the Cuckoo-Clock Heart would be heralded as a triumph. On the surface, it's beautiful: Jack's pregnant mother hikes through a whimsical snowy wonderland where frozen-solid birds flop gracefully into snow mounds, while an older Jack curiously observes the sepia-tinted, sun-covered curves of his local town after years of isolation. Magical, slightly macabre touches -- starting with an ice-cube heart being clipped out from a baby's chest -- add dashes of the bizarre to everything that's going on, illustrated by an intricate visual style that emphasizes lean bodies, wide eyes, and tender expressions in the characters' semi-broad faces. Writer/co-director Mathias Malzieu's band, a low-key but robust mix of classic and alt-rock, supplies the rhythmic energy from scene to scene, coupled with abstract, poetic lyrics that double as an emotional narrative. Independently, all its uniqueness offers a lot to absorb as the hands of Jack's heart tick away along his journey into the world, toward Acacia. The script holding Jack and the Cuckoo-Clock Heart together doesn't do its individual artistic merits the diligence they deserve, though. It isn't wise to think about the premise any deeper than the surface -- how'd Jack made it through childhood fears if love and anger are too much for his clock-heart to take? -- since there's not much to the story beyond its droopy emotional tempo, weakened by the arbitrary limits of Jack's emotional threshold. Hinged on the very brief, love-at-first-sight meeting of a young boy and girl that'll linger for many years, the metaphors laced within Dionysos' conceptual lyrics end up feeling awkward and incompatible against the plain story of Jack's fragile machine of a heart and his forbidden infatuation for Miss Acacia. Those imaginative flourishes that entrance on their own end up being a hodgepodge when stuck together, especially unsatisfying during the singing numbers, rooted in Malzieu's grasp on dreamlike idiosyncrasy and a desire to emulate Burton and Selick's stop-motion tone. What's left but to flip one's mind off and try to embrace the strung-together images and sounds as a quirky children's book in motion. That could work, mind you, had Jack and the Cuckoo-Clock Heart not ended up being such a melancholy affair as its gears kept moving. Jack's ticker suffers a physical and emotional gauntlet throughout -- needlessly tortured during the boy's voluntary school years and reinvigorated during travels outside of Edinburgh in search for Miss Acacia -- a figurative expression of the fragility of emotion, the power of a mother's protective love, and overcoming the fear of heartbreak. Much of those intentions gets obscured in a blizzard of misguided, artificial tragedy late in the film, though, powered by needless dishonesty and manipulation that's consciously engineered for gloomy repercussions. Despite the resolve of its visual splendor and delicate temperament, Jack's story ultimately doesn't offer much of a takeaway beyond breaking down into self-indulgent tragedy and, unfortunately, a feeling of futility about the makeshift boy's journey. Heartbreak may be unavoidable, but there are better ways of conveying that point than this frigid ticking of clockwork, well within the spectrum of these imaginative minds.